January 14th, 2016 (ICR News) A magnitude 4.9 temblor struck at 10:40 a.m. Thursday 36 kilometers southwest of Dominical de Osa, according to Costa Rica’s National Seismological Network (RSN). 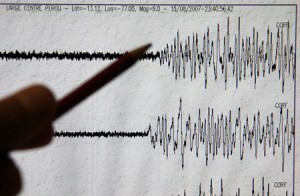 The RSN said the quake was produced by a local fault. Users on Facebook and Twitter reported mild, but long-lasting shaking in Costa Rica’s Central Valley and southern zone. There were in immediate reports of injury or damage.